I was just reading about Weekend Sewing yesterday. That is on my must-get list. Thanks for the other suggestions as well. They all look great. Definitely--more projects I dream of making...when I find time. Maybe I should just quit dreaming and get busy. these look great! i love heather's book, too. I just got Weekend Sewing last week! There is a great loose-fitting top that I'm planning to make. I've bought the fabric and everything ... now just need to find the time! Brie, now that one, I love! Nice list. 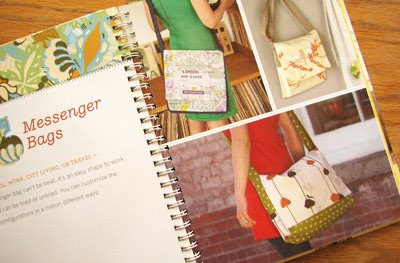 I am obsessed with bags so I think I might just get the Sew What book. i'm getting city chic as soon as i can! thanks for the tips. These are some great books. I want the City Chic. I totally agree with you re: the quilt thing!! And now I'm (slowly) making my own! Hey you were on a post on Print Pattern's Blog! Cool! 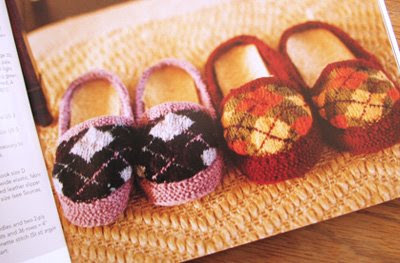 Ohh, I love knitting and haven't heard about this book yet, how exciting. The other books look lovely!! I will have to check these out. Great blog you have! Very inspiring! goody! i'm always looking for more projects to add to my list of things i'll never get to!! I know, Mom. I bet I just lost a couple hundred readers. Oops!! Sorry, quilters everywhere! Please come back! Cat: I REALLY like your quilt. Holy cow. I could actually see myself making that. 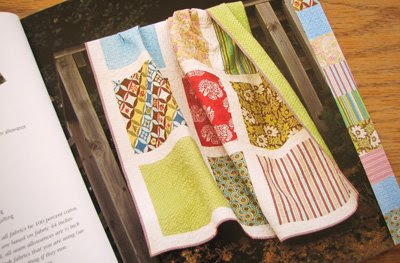 It's kind of like origami, and it shows off each special fabric in its own frame instead of jumbling them all together. I love that each print gets special treatment. This is inspiring! Your blog is really inspiring! I visit most days just to see what you posted and it never disappoints. I love this post about craft books. 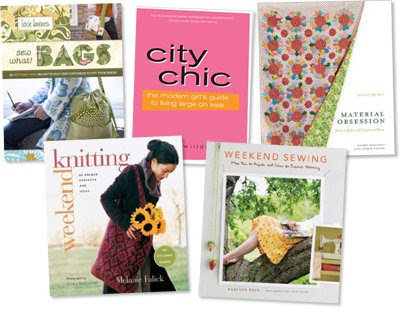 I am just as crazy about craft books as I am about fabric and love to read about new books. I normally do a lot of research before I buy a book and appreciate bloggers posting reviews that help me decide if I should buy it or not. I personally post detailed reviews on all the books I buy. Thank you for keeping me inspired! 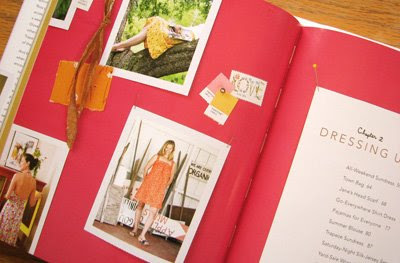 Thanks for posting these books - City Chic looks good. I'd be interested in reading that. Another to add to the Amazon wishlist. I've just made a small bag from the Sew What Bags book and plan to make many more! Great list, thanks! It must have been my lucky week. So many great books came into my house. First, from Marcia at The Printed Page via Read it Forward I received Royal Blood by Rona Sharon. Thanks, Marcia! Through BookMooch I got the first book, The Bad Beginning, in A Series of Unfortunate Events by Lemony Snicket. Tuesday saw the arrival of a huge box of books courtesy of Natasha at MawBooks. I still can't believe how lucky I was to win this giveaway.